On second thought, perhaps it's OK to Hanrahate, just a little. 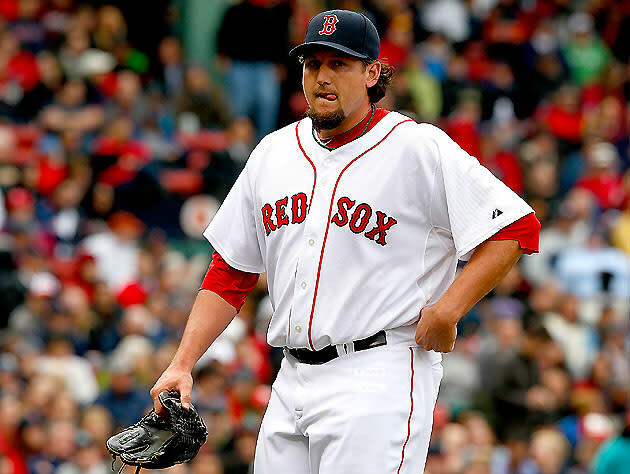 Boston's embattled closer faced only two batters in the ninth inning on Saturday, and he walked 'em both. Hanrahan threw 12 pitches, four of which were strikes. With that, his day ended. He was yanked in favor of Koji Uehara. Hanrahan's mess was cleaned up nicely by Uehara (nine pitches, three outs), and the Red Sox managed to beat the Rays in 10 innings. So the day certainly wasn't a disaster for Boston. "No move is going to be made," [John] Farrell said. "Right now, Joel is going through a little bit of a spell where things aren't clicking for him, but we're still with him." Again, it's not the strongest endorsement you'll ever hear, but it's something. The handcuff here is Andrew Bailey, who pitched a perfect eighth on Saturday, prior to Hanrahan's slop. Bailey has been absolutely lights-out in the opening weeks, giving up just one hit and two walks in his five appearances, striking out six batters, allowing no runs. He's also saved 81 games over the past four years, including six for Boston in 2013, so he's earned his PROVEN CLOSER™ card. Bailey is available in 80 percent of Yahoo! leagues as of this writing; he's the flavor-of-the-day add for save chasers. Go do whatever needs to be done.